If you have questions regarding personal injury, civil litigation or criminal defense, contact the offices of the Bowers Law Firm. While we are headquartered in Wyoming, we maintain offices in Idaho, Nevada, and Smithfield, Utah, for the convenience of our clients. 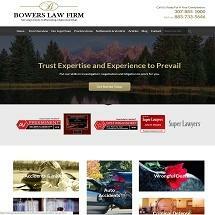 Do not hesitate to schedule a free consultation with a lawyer at our firm. While these are the types of cases we most commonly handle, we encourage clients to contact our firm with questions regarding any personal injury or wrongful death claim. If we cannot directly help, we can provide a list of trusted referrals. The attorneys at the Bowers Law Firm are dedicated to aggressively fighting for the financial stability of our clients through negotiating a beneficial settlement with the at-fault party's insurance carrier. If a settlement cannot be reached, we are fully confident in our ability to represent our clients in court.